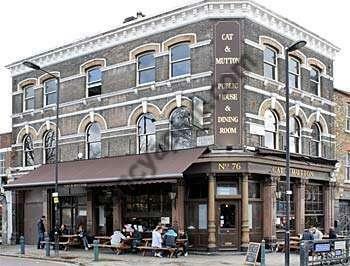 The Cat and Mutton proudly boasts that it has been present in some form in the east end since the late 1600’s albeit under a slightly different name as The Cattle and Shoulder of Mutton. It stands at one end of Broadway which hosts one of London’s many markets on a Saturday and provides a good spot to rest and refresh after battling up either side of the stalls against an endless tide of gawkers with SLRs, foodies with organic purchases and show offs with impractically well groomed dogs. Once upon a time The Cat and Mutton was almost certainly the refuge of many an East End caricature cockney topping up on gin after a hard day selling tat or doing other cockney things. These days it is a much more trendy affair and plays host to a fairly bohemian crowd of twenty and thirtysomethings wearing outfits that would look at home on a 1970s Blue Peter presenter. Regardless of whether you dress like Peter Purves or not there is invariably an affable vibe here and quiet midweek drinks or bustling weekend lunches are equally enjoyable. The one thing I’m not quite sold on here is the kitchen forming part of the bar where some dishes are cooked under the watchful eye of punters queuing for a beer. For me this is a bit like having the abattoir at the front of the butchers so you can watch the animals getting murdered. It feels a little unnecessary and doesn’t lend anything to what is otherwise very smart interior of wooden tables and benches across two floors linked by a rather unique spiral staircase which is admittedly a potential death trap in a pub. This kitchen is also potentially responsible for producing the occasionally available sausage rolls with a world class meat to pastry ratio but truly abysmal fiver to change ratio. This doesn’t claim to be a real ale pub and nor does it try to be one. It does serve the very agreeable Wandle alongside another interchangeable guest ale. Lager options are fairly standard and it tends to offer up something a little more unusual such as jugs of Pimms or Bloody Marys on an ad hoc basis. It’s somewhat middling when it comes to price lurching around the four quid mark for most pints. Summer sees custom spill out onto the street and across towards the adjacent London Fields and sends a constant stream of drinkers in from the park to use the lav. This triggers an amusing game of cat and mouse with the staff trying to work out who is and who isn’t allowed to go for a slash. What larks. All things considered I’d recommend The Cat and Mutton. It’s especially good if you want to have a pub session with a group of chums on a big table together. Get one booked and head on down.